Dr. Marion Blank has spent over forty years studying how children learn to read and is recognized by her peers as one of the world's top experts in literacy and language. In addition to being the co-founder and Chairperson of the Reading Kingdom, she also serves on the faculty of Columbia University where she developed and ran the Light on Learning Program.Dr. Blank obtained her Ph.D. in Medical Psychology from the University of Cambridge in England. 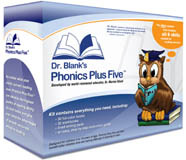 Dr. Blank has devoted her life to helping children learn to read, and she has used her innovative methods to help literally thousands of kids. Now, with her groundbreaking new reading program, The Reading Kingdom, she is making her system available to every parent.